Horn Rapids, WA: Consistent sales for 2nd year in row. * Watch for our next issue, coming Friday, September 20th! Good Morning! More news of community sales--Horn Rapids, Richland, WA is on track to sell 75 to 80 properties for the second year in a row. One reason is the local Tri-Cities economy continues to buck national trends and stay on a stable, consistent course. If you're thinking of visiting the 835-acre community, Tracy Phillips, broker at Horn Rapids, will personally custom create your Discovery package for when you want to visit and experience what this mountain-view golf community has to offer. For more community news and events, four new real estate deals, travel specials and more, see below! > PGA Village, Port St. Lucie FL is listing a beautifully appointed, well-maintained two-bedroom townhome with numerous upgrades, asking price of just $189,000. It features deep tray ceilings with double crown molding, a spacious kitchen with granite counters and a master suite you enter via a private hallway. This townhome’s master bath includes two marble counters with sinks, private water closet and separate shower and whirlpool bath. You also get a carpeted storage room with full AC within the garage and a 30 amp generator hookup. Home is in a neighborhood that has its own clubhouse and pool in addition to the array of PGA Village Island Club amenities. Send me more info! > Heritage Shores, Bridgeville, DE announced a new community policy paired with a great real estate purchase incentive. Heritage Shores bylaws have been amended to allow use of personal-owner golf carts within the community including on the golf course. In response, the builder at heritage Shores, Providence Homes, will for a limited time include a free golf cart for the buyer as part of the home purchase agreement. Send me more info! > Anderson Creek Club, Spring Lake NC is urging home buyers with value in mind to come see its collection of Fairway Green condominiums, priced starting at just $139,900. These superior-quality condos offer many upgrades at the buyer's choice. If you want a private garage, they are now available as add-ons--with a $3,500 incentive when the garage is purchased with a Fairway Green unit. Anderson Creek has has a wide array of other incentive-packaged homes and lots to inspect, including some that are offered with closing costs paid by seller. Send me more info! > Daniel Island, Charleston, SC is getting set to host the Nationwide Tour Championship at Daniel Island on Oct. 24-30. It’s the Tour’s season-ending event where the top 60 money winners compete for 25 PGA TOUR cards and a spot on the 2012 PGA TOUR. Tickets for the Pro-Am Jam featuring Mark Bryan and Friends, including Branford Marsalis, Pat Green and Colt Ford, are on sale now. This special concert event will be held at the Daniel Island Club beginning at 7 p.m. on Tue., Oct. 25, with gates opening at 6 p.m. General admission concert tickets can be purchased for $25. Prior to the concert, Mark Bryan and 23 additional celebrities will participate in a special Pro-Am to be held on the club’s Ralston Creek course on the morning of the Oct. 25. Spectators are invited to view the Pro Am free of charge. Send me more info! > The Landings on Skidaway Island, GA is pleased to announce that Nicole Weller, head golf teaching professional at The Landings Club, has been named 2011 Teacher of The Year by the LPGA Teaching & Club Professionals Southeast Section. The section award also includes an automatic nomination for 2011 National Teacher of The Year and is the latest in a list of honors for Weller, who was named to Golf Digest’s list of Best Young Teachers, as well as the U.S. Kids Top 50 Kids Teachers. Weller earlier this year published an activity book, “Stick to Sports: Let’s Play Golf” that is designed to help juniors, ages 4 to 8, embrace the game of golf. Send me more info! > Heritage Shores, Bridgeville, DE introduces its Drive & Dine Golf Special. Any Monday through Thursday for just $49, or any Friday through Sunday for $59, come to Heritage Shores and play an 18-hole round on the club’s championship golf course, then stay for a lunch at no additional charge. There is no charge for GPS-enabled golf cart rental and one beverage (non-alcohol) at lunch is also included. While on property make a golf shop purchase of $50 or more and be entered to win $200 in shop merchandise rewards. Send me more info! > Teton Springs, Victor ID invites you to enjoy fall in the Tetons. It’s a great time to play golf, fish, or just relax and watch the resident bald eagles. During your visit, All Season Resort Realty will be happy to show you the many ownership opportunities, including a gorgeous lodge home with golf, lake, and mountain views, which originally cost over $1,200,000 and is now listed at only $799,000--furnished and packaged with a membership. Send me more info! 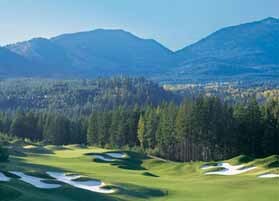 > Teton Springs Resort, Victor, ID This week the Headwaters Club at Teton Springs is hosting the “Leon Vest Invitational” (LVI) Golf Tournament & Dinner supporting the Teton Springs Foundation which has been supporting non-profits serving the Teton Valley since 2001. The Resort is enjoying its warmest temperatures of the summer, so it is not only a good time for golf, but also a great time to look at real estate such as custom houses and Forest and Warm Creek cabins. Several great Mountain Meadows properties are now listed, starting at $439,000. Send me more info! > The Communities at Branson Creek, MO features 6,500 acres offering the best veiws of the Ozarks. Standout real estate values on single-family homes in the Fieldstone Bluffs neighborhood, with 6 floor plans available from the low $200,000s with walk-out basements and three car garage options. Also just announced is the new Fieldstone Pines Townhomes starting at just $139,900. Residents enjoy over 15 miles of hiking, walking and biking trails, two award-winning golf courses and just minutes from shopping, three lakes and over 100 shows in Branson, Missouri. Send me more info! > Anderson Creek Club, Spring Lake NC is featuring an open-plan condo—the last one left in inventory—along Gallery Drive, which is just minutes from the community pool and fitness center. View this property daily from 9 a.m. to 6 p.m., at Building 185 (Unit 201). It’s a 2BR, 2-BA residence at 1,500 sf listed for just $164,900. Interior features granite, hardwoods, ceramic tile, plus crown and chair molding. Send me more info! > Kiawah Island, SC The home at 15 Airy Hall is a current "Best Buy" with it price reduced to $995,000. Located on a quiet cul-de-sac, this 4-BR/3-BA home features sweeping vistas of rolling marsh savannas. The living room looks out on the marsh with windowed walls, and French doors open to a screened porch with soaring ceiling and fieldstone fireplace. The kitchen features stainless steel appliances and the home comes with an integrated television and audio package and is furnished. Move right in. Click here for more information about Kiawah Island! > Heritage Shores, Bridgeville, DE has great golf incentives in the shop and out on the course. Earn $200 in merchandise rewards just by entering your name for a drawing based on a purchase of $50 or more in golf merchandise. Then Beat the Heat when you head out before 1 p.m. with the Vantage Rate of only $54. Tee off after 4 p.m. and you save with the $49 Twilight Rate. Send me more info! > Solivita, Poinciana FL has a limited-time visitation special called Discovery Days. Stay 3 days, 2 nights for $69, with lodging onsite in one of the community’s fully furnished homes. Enjoy complimentary lunch and dinner, use of all recreational facilities and a personal golf cart during your stay. While on-site you are encouraged to enjoy the multi-million dollar Palms Amenity Complex. Send me more info! > The Communities at Branson Creek, Hollister MO unveils a Couples Stay & Play visitation deal. This package provides golf, lodging, lunch and a great entertainment bonus—show tickets to Legends in Concert for two. Price of the package is only $69.99 per couple. Enjoy golf at your choice of three championship courses. Send me more info! > Red Ledges, Heber City UT is now offering a 3-day/2-night mountain getaway for only $478 per couple. Package includes two nights at the exquisite St. Regis Deer Valley, a scenic airplane tour of the spectacular fall colors, a round of golf for two on the community’s Jack Nicklaus Signature Course plus a tour of the property and amenities. Ownership opportunities include homes from $495,000 and homesites from $195,000. Offer ends Oct. 31. Send me more info! * Watch for our Next Issue coming Tuesday June 21st! Good Morning! Good deals from the state of Georgia lead off Today's Deals, plus travel specials from Pennsylvania and Michigan. Also, see below for new lower prices for Red Ledges, UT, and the new Arts & Crafts Bungalows at Treasure Lake, PA, and golf events at Hampton Hall, Bluffton, SC. > The Georgia Club, Statham GA presents details of its attractive Invitational Golf Membership, now available. Join now and enjoy the following: Payments spread in annual installments over six years with no interest; complimentary golf cart use for the year; 10 complimentary Green fee/Cart fee passes for friends, business associates or relatives (this alone is a $780 value); plus complimentary Locker Rental for the remainder of 2011—that’s a $198 value. Click here for more information about The Georgia Club! > The Landings on Skidaway Island, GA recently held an Open House event to present a premier residence at 3 Hunting Lane. Priced now at $378,000, this home is graced with a golf view and 3 BRs/, 2.5 BAs. The living room has custom bookcases, a beautiful fireplace and a newly remodeled bath with granite. You'll enjoy the formal dining room, spacious family room, office and outdoor patio. Click here for more information about The Landings! > Forest Dunes Golf Club, Roscommon MI reminds visitors of its popular Discovery Package, which includes 3 days/2 nights in luxury accommodations, time to explore Forest Dunes and the surrounding area, a personal VIP tour of Forest Dune's neighborhoods, amenities and scenic beauty, Member-for-a-day privileges, dinner for two at our award-winning Clubhouse, breakfast for two and golf for two on the top-ranked golf course in Michigan. This exceptional value is priced at $279 per couple. Space is limited Click here for more information about Forest Dunes! > The Links at Gettysburg, PA is responding to popular demand and extending its $10 off coupon through the end of June. All you need to do is print out the coupon, make a tee time mentioning the $10 off promotion, and bring the coupon with you the day of your tee time. Also, don't forget about the "Pay What You Score" draft beer special. Bring your scorecard into the Red Rock Grille after your round and your first draft beer will be the price of your score (for example, shoot a 90 and the price is 90 cents). Click here for more information about The Links at Gettysburg! > Hampton Hall, Bluffton SC has an original and inviting series of golf events scheduled for mid-June. This evening, June 17, it’s the Hampton Hall golf Hole-in-One Party, a pasta-and-rib dinner to bring together all golfers who ante up for hole-in-one celebration “insurance.” This week the golf program also included a Skills Contest followed by dinner and awards in the Golf Clubhouse. The regular Women’s Golf Month Clinics are also ongoing. Click here for more information about Hampton Hall! > Treasure Lake, Dubois PA has finished its first re-built bungalow--a year in the making—and has it available for purchase. Known for its simple beauty and strong lines, the bungalow home style is pure American from its large front porch to its exposed rafter tails. Porch columns are often tapered (smaller at the top and wider at the bottom) giving them the appearance of anchoring the home to the earth. A Treasure Lake bungalow will be be featured in "Cottages and Bungalows" magazine later this year. Click here for more information about Treasure Lake! > Harbour Ridge Yacht & Country Club, Stuart FL says it’s not too early to book a rental property for the 2012 season. Winter escapes can be arranged for prices that range from $3,500 to $6,000 per month, including all privileges at Harbour Ridge. Accommodations include 2 & 3 bedroom condominiums, patio homes and golf homes with views of the golf course, a preserve or the St. Lucie River. Renters are issued a temporary membership number, pay discounted green fees for golf and incur no charge to use of the fitness, swim, and tennis centers. There’s a one-month minimum and all rental prices are negotiated. Click here for more information about Harbour Ridge! > Forest Dunes Golf Club, Roscommon MI makes available a 3-day, 2-night Discovery Package that includes dinner for two, breakfast for two and golf for two on Golf World magazine’s No. 1-rated public-access golf course in the US. Send me more info..
> Anderson Creek Club, Spring Lake, NC's Discovery Package includes accommodations at the new Inn at Anderson Creek Golf Club, breakfast for two, complimentary round of golf for two, dinner for two, use of all amenities and VIP real estate tour. The Inn is tucked amid the long leaf pines of the club's Davis Love III-designed golf course and is just steps from the Clubhouse & Grill. Cost for the full package for 3 days/2 nights is just $297. Click here for more information about Anderson Creek Club! > Palmetto Dunes, Hilton Head Island SC announces its new golf Stay-and-Play package price. Enjoy four days /three nights in a 2-bedroom villa at Palmetto Dunes Oceanfront Resort; two or three rounds of golf on your choice of three championship courses; two hours of complimentary tennis court time daily; and, preferred rates and priority access to all resort activities and amenities. Rates are $153 pp/per night if you play two rounds, $178 pp/per night if you play three rounds. Click here for more information about Palmetto Dunes! > Red Ledges, Heber City, UT’s Discovery Visit includes 3 days/2 nights at the 5-Star resort St. Regis Deer Valley, private tour of Red Ledges, plus your choice of either golf for two on the Jack Nicklaus Signature Golf Course; trail ride for two, or tennis lesson for two at the Cliff Drysdale Tennis School. Cost is just $349/dble occ. Click here for more information about Red Ledges! NEW COMMUNITIES COMING ONLINE IN 2011! * Watch for our next issue, coming Friday, February 18th! Good Morning! New specially priced real estate make your dream home even more attainable, plus travel getaways, special property sales at a fraction of their cost of just a few years ago and more top today's news .See all the details below! > Colleton River Plantation, Bluffton, SC presents an outstanding value on deep-water property complete with its own dock, priced at $699,000. The next least-expensive lot of this type is a short sale at $999,000. The only other lots in the community with private docks are listed at least $1 million higher. Late in 2008, a Colleton River deep-water-dock lot sold for $2.2 million. Click here for more information about Colleton River Plantation! > Reynolds Plantation, Greensboro, GA presents its Magnolia Package, valid April 2 through April 9 and ideal for any golf fan en route to one of the biggest annual events in sports. Priced from $598 per night per cottage, package includes a night’s accommodations in a Marina Cove Village cottage or comparable lodging and full Southern style breakfast at The Plantation Clubhouse. Subject to availability. Rates do not include applicable state and local tax, gratuities or service fees. Click here for more information about Reynolds Plantation! > Indian River Colony Club, Melbourne FL has an attractive Getaway Package for three days and two nights at only $99 per person. Good through the end of February, it includes lodging in a nearby hotel, a tour of the community, a round of golf on IRCC’s 18 hole/par 72 golf course, and dinner at its private At Ease Club. Tour will be hosted by one of a current resident. Click here for more information about Indian River Colony Club! > Watersong, Hutchinson Island FL alerts buyers to continued 80 percent off pricing versus 2008 levels. However prices have been rising on a steep curve of late. Right now a rare South Florida oceanfront lot is available in the community—asking price is just $280,000. Click here for more information about Watersong! > Tesoro, Port St. Lucie FL is a buying opportunity on the Treasure Coast. Currently at the reduced price of just $449,000 is a bank-owned custom golf home on the fourth green of the golf course. It is 3,400 sq. ft and accented by exquisite stonework. Also available is an estate homesite, just listed at $65,000—which is 10 percent of its 2008 pricing. Lot is in an exclusive neighborhood and the seller is motivated. Click here for more information about Tesoro! > Blackstone, AZ, countering the trend that has forced many private golf clubs to open for public play or drastically reduce member services to remain viable, has reached an important milestone—signing up its 100th club member. The club has also enhanced its membership opportunities to include expanded hours at the Hacienda dining room, which is now open every evening for dinner except for Mondays, a greater variety of group fitness classes and other member benefits. Click here for more information about Blackstone! > The Communities at Branson Creek, Hollister MO and its Murder Rock Golf & Country Club present an invitation to a lively dining event that will kick off the club’s 2011 season. On Fri., Feb. 25 Murder Rock will host a Steak and Shrimp dinner. Grab that special someone and make it a great night to remember at the Murder Rock Club House. Click here for more information about Branson Creek! > Lake Ridge, Dallas, TX’s wide array of hilltop and heavily wooded homesites are surrounded by dramatic views and value-priced. Homesite No. 1962 is one acre, treed and level—now at $39,900, a reduction of $22,000. Homesite No. 2514 is an online special at $125,000 and ideal as a personal fishing retreat. Click here for more information about Lake Ridge! > Teton Springs Resort, Victor, ID – High Mountain Heli Ski from this Teton Springs Lodge condo is now available for $360,000 with owner financing. Condo features separate master suite, 2 BAs and good short-term rental history. Click here for more information about Teton Springs! > Jefferson Landing, Jefferson, NC The new Hampton Inn in West Jefferson is now offering a 5% discount for Jefferson Landing visitors who are clients of Regency Properties. Discount is off the already low weeknight rate of $87 and weekend night rate of $129. Call 336-846-4000 or Click here for more information about Jefferson Landing! > Dataw Island, SC’s new membership incentives are available through May 31. Anyone who purchases a home or homesite by the end of May can receive a reduced initiation fee of $17,000 for Golf and $12,000 for Island Social. New members also receive monthly incentive credits on their statements for up to two years. Click here for more information about Dataw Island! > Hampton Lake, Bluffton SC’s arrangement with Hampton Hall, the community right next door, lets Hampton Lake residents purchase equity golf memberships to a Pete Dye championship course just a golf cart ride away. Hampton Lake residents can also buy equity golf memberships at Berkeley Hall, a short drive away, with its two Tom Fazio courses and world-class practice area. Click here for more information about Hampton Lake! Private, 1,000-acre community, 36 Tom Fazio holes, tennis, clubhouse, homes from $182,900. Come see golf and waterfront videos at the GolfCourseHome Screening Room at the first-ever 'GolfCourseHome VideoFest,' pick up community information and request community brochures. Publisher David Lott will be on hand to answer your questions about today's real estate market. Dataw Island, SC: Reduced initiation fee til May 31. * Watch for our next issue, coming Tuesday, February 15th! Good Morning! New travel getaways, reduced community fees, special sales and more head up the news today.See all the details below! > River Landing, Wallace, NC invites you on its Southern Hospitality Getaway. Enjoy luxurious on-property lodging and a VIP tour of the neighborhoods and amenity centers. Package provides owner-for-the-stay privileges at River Landing’s Sports & Fitness Club, swimming pools, clubhouse and dining. Play golf, play tennis and take a fitness class, then tour the local Duplin Winery for a wine tasting, followed by gourmet dining in the Lakeview Room of the community’s clubhouse. Price is just $139/couple. Click here for more information about River Landing! > Lake Ridge, Dallas, TX lets you choose from a wide array of hilltop and heavily wooded homesites surrounded by dramatic views, magnificent hardwoods, and rolling hills. Homesite No. 1962 is one acre, treed and level—now priced at $39,900, a reduction of $22,000. Homesite No. 2514 is currently an online special at $125,000 and is ideal as a personal fishing retreat, spanning 1.14 acres and sharing a private pond with four neighbors. Click here for more information about Lake Ridge! > Lake Blackshear Plantation, Cordele, GA the developer of Ironwood Golf Course, announces a major price reduction on its 39 interior lots. All interior homesites have been reduced to $7,500 as a Spring Spectacular. Click here for more information about Lake Blackshear! > Dataw Island, SC presents new membership incentives available through May 31. Anyone who purchases a home or homesite by the end of May can receive a reduced initiation fee of $17,000 for Golf and $12,000 for Island Social. New members also receive monthly incentive credits on their statements for up to two years. Click here for more information about Dataw Island! > Hampton Lake, Bluffton SC has arranged with Hampton Hall, the community right next door, under which Hampton Lake residents can purchase equity golf memberships. Hampton Hall features an 18-hole Pete Dye championship course just a golf cart ride away. Hampton Lake residents can also buy equity golf memberships at Berkeley Hall, a short drive away, with its two Tom Fazio courses and world-class practice area. Click here for more information about Hampton Lake! > Daniel Island, Charleston, SC welcomes one of the country’s largest homebuilders, Pulte Homes, to the Charleston market. Pulte Homes is currently building its first speculative homes on Daniel Island in Smythe Park. Ranging from 2,131 to 2,650 sq. ft., these residences are currently priced starting at $518,400. They include features such as granite counter tops, Whirlpool stainless steel appliances, gas fireplaces and spacious porches. Click here for more information about Daniel Island! > The Landings on Skidaway Island, GA has hired Greg Sucher as aquatics team manager. Sucher’s career began when he was a volunteer swim coach while stationed on the island of Okinawa as a U.S. Marine. While serving as the head coach of the Savannah Swim Team from 1995 to 1997, he coached a young Landings resident swimmer who captured 9 individual state titles, and two top ten national level rankings as a ten year old. Click here for more information about The Landings! > Indian River Colony Club, Melbourne FL celebrates its Silver Anniversary on Feb. 19 with a Community Fair at the popular Colony Club Plaza. Guests will enjoy entertainment, including the Salty Dogs, Cart Barn Players, the new Happy Zebras Banjo Band, and the new Colony Clowns. There will also be a rubber duck race in the water between the golf pro shop and the practice range. Bring cameras to enjoy an antique car display with photo opportunity. Click here for more information about Indian River Colony Club! Lake Blackshear Plantation: Golf/lake community in south GA.
* Watch for our next issue, coming Tuesday, February 8th! Good Morning! We are pleased to announce the addition of Lake Blackshear Plantation, Cordele, GA, to the GCH Network. Featuring a new owner-operator for its Ironwood golf course, the community is now offering all homesites for less than $20,000. Quarter-acre homesites are $15,000 and half-acre lots are just $18,500. First-year Golf Membership is included with purchase. See below for more details and today's new deals and travel packages. > Barton Creek Resort and Spa, Austin TX presents its Heaven On Earth Package for golfers. For $142 per person, the package includes luxury resort accommodations, custom club fitting at the new Callaway Performance Center, daily breakfast and choice of either extra golf privileges or one spa treatment per person per night of stay (50-minute Purifying Facial or 50-minute therapeutic massage). Click here for more information about Barton Creek! > Sunset Dunes, PEI, Canada alerts buyers in this fast-selling community to the availability of guaranteed vendor financing for up to a 15-year term with as little as 10% down, 2 years interest free and an rate of 4% for the balance of term. Sunset Dunes is in the third and final phase of development, comprising the last 20 lots within the development. All oceanfront homesites in the first phase have sold—there are just five oceanfront lots still available. Click here for more information about Sunset Dunes! > River Dunes, Oriental, NC is staging an introductory weekend to sporting clays & coastal cuisine. The price is $65 per person and includes safety instruction, transportation, lunch, use of range and shells (guns available). Lodging value is a 30% discount in the Guest Cottages for participants. This a beginner-friendly and fun sporting experience. On Saturday evening, enjoy oysters on the lawn, followed by a Fins & Feather Dinner including grilled seafood and roast duck. Click here for more information about River Dunes! > The Communities at Branson Creek, Hollister MO, member of the Branson/Lakes Area Chamber of Commerce and CVB, joined with these groups in announcing that Thousand Hills Golf Resort and Pointe Royale Resort & Golf Course are now part of the area’s new golf-destination cooperative, formed to provide discerning travelers with values and options. These two courses join four others in comprising a rising-star golf destination, including the No. 1-rated course in Missouri, Branson Creek Golf Club. Click here for more information about Branson Creek! > The Cliffs Communities, Travelers Rest SC and Urbana Companies, LLC, a Dallas-based developer, recently announced the creation of a joint venture. Urbana’s initial investment in the venture allows The Cliffs to significantly reduce its outstanding debt, increase cash flow and provide capital for The Cliffs ongoing operations. The financial terms of the transaction were not disclosed. Click here for more information about The Cliffs! > The Landings on Skidaway Island, GA - The Landings and Wilmington Cabinet Company recently presented a $2,500 check and numerous toys to The Children’s Hospital at a special ceremony at Memorial University Medical Center in Savannah. The donation was raised from contributions collected at the 2010 Landings Designer Holiday Showhouse in December. Click here for more information about The Landings! > The Landings on Skidaway Island, GA is the place for a football excitement this Sunday, Feb. 6, as the club hosts its annual Landings Plantation Super Bowl Party. Festivities, to begin at 4:30, include a $28 buffet with draft beer and house wine or $19 for the All-You-Can-Eat Buffet and soft drinks. Attire is casual—jeans and athletic wear permitted. Smaller parties and rooting sections may be grouped together. Click here for more information about The Landings! > Willoughby Golf Club, Stuart, FL’s price reduction to $345,000 from $399,000 on a 3BR/3-BA home that features a spacious living room which opens onto a large covered lanai. Also included is a built-in entertainment center and swimming pool. Send me more info…. > The Bridges at Preston Crossings, TX, The Reserve at SugarTree, TX, and Lake Ridge, TX are part of a free Super Bowl Ticket Drawing open to anyone who tours one of these North Texas properties any time between now and Jan. 30. You will be automatically entered to win a pair of seats to the Super Bowl in Arlington, Tex., on Feb. 6. Click here for more information about The Bridges at Preston Crossings! Click here for more information about The Reserve at SugarTree! Click here for more information about Lake Ridge! Lake Blackshear Plantation is one of South Georgia's newest planned communities. Offering a relaxed lifestyle setting in a golf and lake community, residents enjoy its small town charm and diverse variety of activities, from golf, fishing and boat rides to taking a stroll or horseback riding. The community's Ironwood Golf Course is a fun yet challenging 18-hole course that features open fairways and undulating greens. This 6,900-yard layout uses natural streams, bunkers, ponds and rolling terrain to test the golfer while creating clear views from the homesites. Just across the street is 8,700-acre Lake Blackshear. Boating, skiing, and fishing are popular activities enjoyed year round. Lake Blackshear has also been included in the "Go Fish Georgia" program which promotes easy access to the lake. Perfect for Visiting: Lake Blackshear Resort and Golf Club is located less than 10 minutes from Lake Blackshear Plantation in Georgia Veterans Memorial State Park which offers hotel and conference center, marina, two restaurants, dinner cruise boat and golf course. Click here for more information about Lake Blackshear Plantation! Horn Rapids: Spectacular desert mountain views. new neighborhood, Desert Summit, is now available. temperate Tri-Cities region of Washington. Suncadia, WA: Pristine location on 6,300 acres.